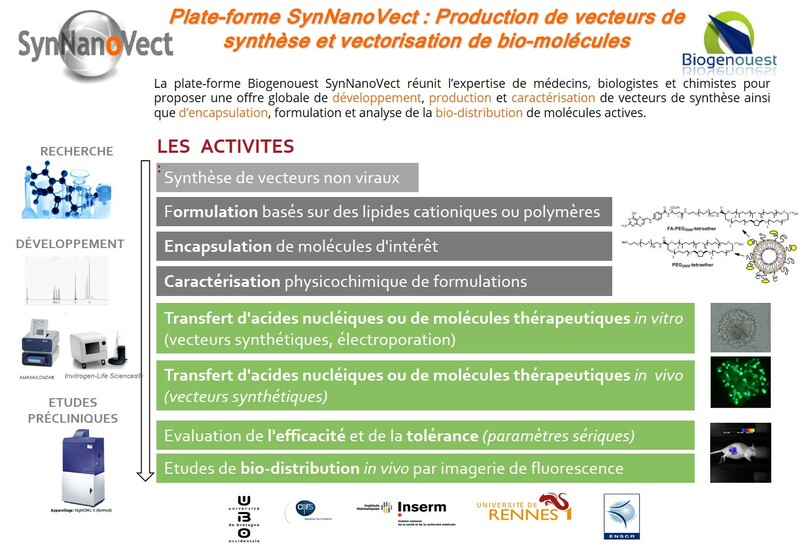 The platform which is shared by UBO (Tristan Montier) and Inserm U-991, offers a wide range of effective synthetic vectors both in vitro and in vivo for the transfer of nucleic acid constructs and therapeutic molecules and bioluminescence and fluorescence imaging system for small animal. Bioluminescence facilities are available for evaluating the effectiveness of vectorization and / or visualization of the biodistribution of the nano-objects by fluorescence. Expertise is available for the characterization and formulation of nanocomplexes and pre-clinical evaluations (toxicity and inflammation). The platform also provides training on electroporation equipment.